Safely store your products with this Cambro 2SFSPP190 CamSquare 2 qt. food storage container! Made of durable polypropylene, this food storage container is designed to resist stains, making it a dependable addition to your kitchen. Thanks to its square shape, it can be conveniently packed onto shelves without wasting space, while its translucent construction provides easy product visibility for added convenience. Plus, the easy-to-read kelly green-colored graduations help you manage your inventory at a glance. This is very effective for brining poultry, beef and pork roasts, and even making saurkraut and pickles. It is easy to clean and doesn't acquire off odors or scratch easily. This fits nicely in a refrigerator; better than a round container. If you actively use more than one, get each its own lid. We purchased these containers for storing dry goods. The square shape fits nicely when multiple are used. When combined with the proper Cambro Lids, they form a good seal. I would not suggest that you use these if you are worried about them tipping over with liquid inside. Note that these do not stack with the larger sizes. I bought these American-made Cambro storage containers to replace only slightly cheaper containers I bought here that turned out to have been made in China. The latter containers began to crack after just a few uses. I'm gratified to see that the Webstaurant Store no longer carries them, and I'm sorry I gave them the positive review I did. These containers, however, are great! Dishwasher safe, and no cracking. Always go for Cambro if it's available! Great containers for organizing your professional /home pantry or shelf. Cambro is the brand trusted by most food establishments, very durable and stackable. Lids for perfect too. This size is perfect for items like nuts, dried Coconut flakes and bakery toppings. I bought this container to take lunch to work and did not regret, since it is compact and can be put in a small bag. I use these in production of pet treats for freezing/thawing chicken. They are the answer to my problem of other commercial boxes being too heavy for some to lift. They store on top of each other easily, very durable and the colander addition makes thawing too easy. Great containers for storage and food prep. I have been using these containers throughout my career and brought some into my home for easy prep and storage. Excellent quality Cambro food storage container. The polypropylene plastic is translucent, and cheaper than the clear polycarbonate version. I use these to store dried beans and opened packages of refrigerated pasta. The 2 quart translucent food storage container is really great for kitchen use. It makes food storage and identification so much easier in the kitchen. great size for storing small amounts on my fridge or pantry. they wash easily on my high temp dishwasher and are stackable! really happy with the product. So far they look great. Can't wait to see how they hold up to the riggers of cooking. Easily washable and dishwasher safe and stackable. BEST food storage every. This small size is perfect for small leftovers and sauces. Make sure to get the lids that go along with it. Super quality, cheap price, and sturdy. I must have about 20 of these containers, they are great for prepping, and stack wonderfully in the fridge or for traveling for catering jobs. We like to use these food storage container for storing our smaller stock of dry ingredients as well as cut up poultry. They're easy to run through the dishwasher and last for ages! To ensure that things are sealed efficiently we like to cover with saran wrap and then top with a Cambro lid before storing. Simple, sturdy long-lasting product. I have been using these for storage of dry productions (grains, sugar, flour) regularly for a year, and they are showing no sign of wear. The lid shuts securely, and the translucent container shows the contents (and quality) of what is stored in each. I purchased this along with the Cambro SFC2452 lid to store brown sugar. It fits a 2lb bag with some room to spare for a scoop. The container is sturdy and is easy to open/close. So far it's keeping my brown sugar from drying out. I like that it stacks nicely with other Cambro square containers. We have had these over a year and they are holding up excellent. They are very sturdy. They stack well. The graduation marks haven't worn off. These Cambro containers are great because they are translucent, so you can easily identify what is inside. They are stain resistant, durable and can hold a range of temperatures. These 2 quart cambro containers are perfect for storing small amounts of food and liquid. The lids fit tightly and they work well for transporting food. This is the perfect size for storing portioned meats or sliced cheeses for sandwiches, prepped vegetables or prepared sauces. I find them to be durable and resistant to staining and picking up flavors. They stack nicely for cooler transport for catered events. Cambro provides the very best quality in everything they offer. These containers are so good and they are great in our commercial kitchen. Plan to order them again. Can't go wrong with the purchase of these Cambros. They are study and hold up well with daily use at the cafe. Best price too! Similar to the white and clear containers, this is good alternative to purchase that will work just the same. The translucent container allows you to see what product you have on the inside and get an accurate measurement of how much you have inside with the graduations. This can work for any dry, cold, or freezer storage. 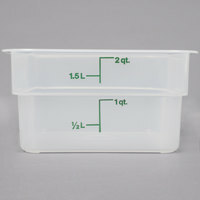 These 2-quart containers are great!. We use them in our Cafe for everything. This size is perfect for ingredients and easily stackable with the green lid sold separately. Very nice containers. I use them primarily to store things in the freezer- they stack nicely and make it easy to get access; do not get brittle in the freezer. These containers are great. They work well for the smaller items and to transfer food into when there isn't much left. No kitchen should be without 2 qt containers they are a great space saver. Small size is very convenient for storing toppings, leftovers, or other small items in an airtight container. This design makes it easy to stack and store lots of different ingredients in a small space. Excellent for marinating single fillets or other cuts of meat or for making an egg wash or light batter. the wide container mouth allows easy access with your hands. Great 2 qt container. Perfect for storing small portions. It fits great in the refrigerator too. I like that I can see what is inside through the outside. Don't forget to get the lid! These cambros are the best. I worked in a commercial kitchen for several years and these were invaluable. They're strong, dishwasher safe and stack nicely, saving lots of space. I've missed having them, so I purchased a couple for home use. They've been great to have on hand! We use these 2 Qt Cambros for storing dry ingredients that we need in smaller amounts. The wide nature of the top makes it easy to scoop ingredients out, and when using these Cambros with their lids, we can stack several at a time very easily and securely. This cambro is really useful for storing small quantities. We typically use the larger cambros when we mix doughs and batters but will condense into this smaller one when we need to free up the larger ones. They are compatible with the same lids as the 4-qt containers which is really helpful too! The 2 quart food storage container is the perfect size for stacking in our reach in cooler. Stands up to many dishwashing and the green lettering does not fade. We use both these and the polycarbonate containers and both types have worked very nicely for us for the last ten years. We highly recommend them both. Love these versatile storage containers. The Cambro CamSquare 2 Qt. Translucent Food Storage Container is great for smaller amounts. I've used it to store dry goods, soup, and frozen foods. It's great for small batches of ice cream. I also love using it for foods that need to go from freezer to fridge (to thaw). Really strong and durable plastic containers. We use them along with the proper lids to store food and stay with in health department compliance. Great price and value. Everyone needs a dozen 2 Qt. Cambros - so many uses. This is the perfect sized container. I have to cook a special diet for my dog and I got tired of scrounging around for containers and trying to fit them all in my freezer and fridge. Each container fits one meal. Being able to stack them has saved me so much room. They are so durable and I am glad that the lid are sold separately so that you can buy a few extra. I love these containers, we have them in every size around the bakery. Easy to clean, has measurement on the outside and is clear so you can see what is being stored. I absolutely love these containers. Excellent material sure to last and can use in freezer. Measurement is clear and easy to read. Good for liquids as well as dry ingredients. are outstanding for small portions of food, it helps save space in the refrigerator and everything looks much neater. Although they are not transparent plastic, can see well the content. This product is great and very durable. They stack well inside each other, and on top of each other. I use these containers after I break down ingredients that I will use for the day. I use these to practically store everything and they do their job great. I love that the have the quart measurements on them and they clean well in the dishwasher. these storage containers are the best thing ever they stack any where you put them empty or full in freezer frig or in pantry very durable. These little Cambros work great for all the different spice blends I put together. Cambros are the best and webstaurant has the best prices around. Great containers for small bags of specialty flour, etc. I also store cornmeal and things like that in these. It's nice they are BPA free. These containers are perfect for many things. Whether to store dry foods like pasta or cooked foods like potato salad. I also use them to make a salad in. I find them to be sturdy and the lids fit well. I ordered the 4qt. and 6qt.to store rice in. The 2 quart container works perfect for storing chicken and tuna salads. The see thru design allows and measurements allows you to see the quantity you have. The square shape makes storage more space efficient. We've been using the container to store leftovers or parts of large batches. I've uploaded a picture showing it used for mashed potatoes, but it's great for storing large batches of sauce or soup in the freezer for later. Unfortunately, half of the containers we received have the markings blurred, but that's fine as it's legible enough for us. Excellent food storage container with air tight lid. Great price and quality product for all your storage needs. Easily stacks and can be organized nicely in refrigerator. Nice solid addition to our existing storage containers. Match up well to existing lids and they are very easy to stack and store. Price is great. All you would expect from cambro - heavy duty, easy to wash, markings are easy to read and don't wear off. You have to slightly underfill them to get the lids on, but that's my lack of experience and not anything to do with the product. We love these food storage containers. We only use cambro for their high quality of product. The measurements on the side are very helpful for us to keep control of our food cost. These 2 qt containers are durable, and have infinite uses. The square design is perfect for saving space in our tiny kitchen, and it's possible to see the level of product in the container through the plastic. The translucent plastic is better than the white but not perfectly clear so it can be hard to identify certain foods if unlabeled. I love cambro's containers. I use the square ones for storing ingredients and the gradations are amazingly helpful for knowing how much I have left of an ingredient. They are compact and do not waste much space at all! These work great in the kitchen and in the bar. Holds just about anything from cut fruit and veggies to bases for soups and stews. GREAT! This container is nice and sturdy and the green graduations are easy to read - even with green vegetables in the container (thanks to the translucent white container itself). I've used this thing for all sorts of products, but lately it's been used to hold a cinnamon-sugar blend for Churros. It's big enough to use to shake churros in but small enough to store just about anywhere. I still can't get over the price on these. Best price I have ever seen on cambros. I've been using this product for years and the quality is outstanding. I use these for the home for everything from storing chopped items to freezing leftovers. They are easy to stack in the freezer, fridge and even the cabinet. Great storage for the price. Not nearly as fragile as other, more rigid versions of the same product. After high temp wash lids and containers do not fit as well as I hoped. Despite that flaw I will likely buy again. Great for small jobs, this container is very sturdy and looks like it will last. I hope it stays as crystal clear as it is today! These storage containers are just what we were looking for. We keep everything in these. They are also a great buy, haven't found a better price! This little container is great. This is the perfect size to store a one pound bag of flour. For a five pound bag of flour, the 6 quart size is great. I love how the translucent material shows enough of the product so you know how much is left. Great value and I'll definitely be buying more of these. they stack so well in my pantry. I love these containers to keep dry goods in. They're heavy duty enough to handle boiling liquids and the lids fit fairly tight. They are not however airtight which would be ideal. Stack very easily also. I love these. You can never have enough. Whether at home or business these are great for storing dry goods as well as prepared items. Easy to label (I use masking tape) and stack-able for easy organizing. Cambro is a great brand name. Great value! We use these for storing our scone mixes, extra frostings/fillings, random ingredients, soup, etc. Easy to label and clean. Keeps our cooler organized! These containers are great for storing food items in the refrigerator. I really like the way they are more efficient with space compared to a round container. These things seal great and are very sturdy. The Cambro containers are much more durable than some other brands I've used in the past. I use them for storing bulk spices. The Cambro 2Qt. Square Storage containers that were purchased are the best. They are very durable and efficient and reasonably priced. It is very useful to have a measuring system located on the actual serving bowl itself. What a bargain on a name brand container! Excellent material sure to last! Easy to read measurement markings! Good for hot or cold liquids as well as dry ingredients! I love Cambro's storage containers, I used to buy them for home use before starting my own food business. The lids may crack if stored in a commercial freezer.